1.Heat grill pan over medium heat. In small bowl, stir sour cream and 1-1/2 teaspoons seafood seasoning. 2.Coat tilapia with oil; sprinkle with remaining 1-1/2 tablespoons seafood seasoning. Place tilapia in pan; cook 6 minutes or until internal temperature reaches 145°, turning once halfway through cooking. Transfer tilapia to plate; loosely cover with aluminum foil and let stand 5 minutes. 3.Cut tilapia lengthwise in half. 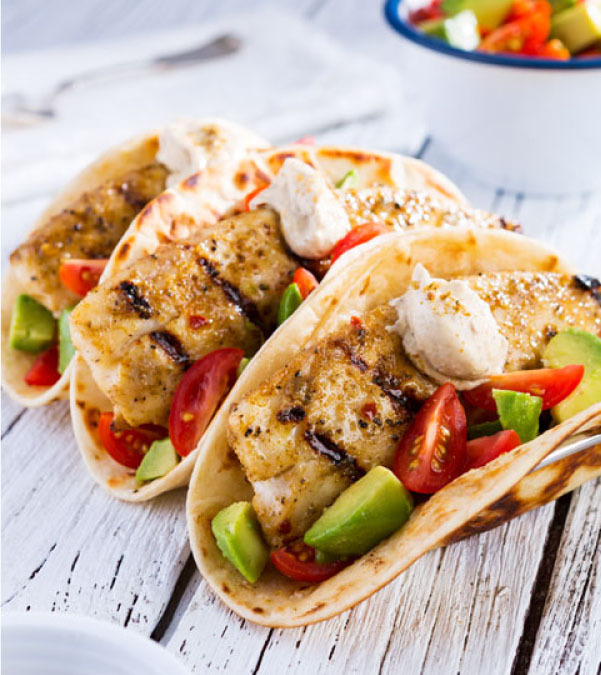 Fill tortillas with tilapia, avocado and tomatoes; evenly top with Seasoned Sour Cream. If time allows, let the Seasoned Sour Cream sit 30 minutes or longer to allow the flavors to meld. A common problem when preparing fish is overcooking, resulting in a dry texture. Properly cooked fish should be just opaque, flaky and moist.